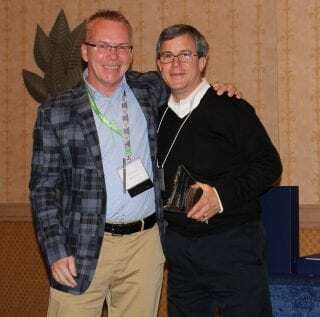 Michael T. Miller, dean of the College of Education and Health Professions, was named Distinguished Service Award winner at the Eastern Educational Research Association Conference in Myrtle Beach, S.C., in late February. Miller has been active in Eastern Educational Research Association for more than 25 years. During his tenure, Miller took on various leadership roles in the organization, including session chair and discussant, reviewer, twice served as journal editor, president-elect and president. He is the immediate past president of the association. Past president David Shannon of Auburn University nominated Miller for the award. Shannon’s nomination noted that Miller has always promoted Eastern Educational Research Association’s mission, encouraging others to become involved and make significant contributions. He also edited the association’s Journal of Research in Education from 2008 to 2012. “He has also been willing to take on whatever responsibility was necessary to help the organization and it has always been a pleasure to serve with him,” the nomination stated. “As journal editor, Michael elevated the status of the journal through his solicitation of quality researchers to consider JRE as an outlet for their scholarship. “During and beyond his tenure as editor, Michael led panels in many EERA sessions aimed at helping EERA members develop research agendas and prepare their research for publication. As a member of many of these panels, I could always count on Michael to offer solid practical advice for those struggling to establish and maintain a research agenda,” the nomination said.